A sophomore and freshman at the University of Rochester hope to encourage a new generation of their fellow Rwandans to remember the lessons of their country’s horrific genocide two decades ago. The project, organized by Ian Manzi ’18, a data science major from Kigali, and Derrick Murekezi ’19, a geology major from Nyagatare, has been selected to receive a $10,000 grant from Davis Projects for Peace, a highly competitive national program that promotes peace and intercultural understanding. The two will use the funding to implement their summer project, titled “Critical Thinking for Peace: Sustaining Peace in Post-Conflict Regions,” in Rwanda this July. They will plan, set up and operate a young leaders’ peace camp for high school students, where camp-goers will reflect on Rwanda’s 1994 genocide. Davis died in 2013 at 106, but her family continues to honor her legacy by funding across the globe. The sleepover camp will take place from July 23-29 in the eastern part of Rwanda, with 30 high school students attending from across the country. Manzi and Murekezi will be responsible for day-to-day activities, organizing instructors from several organizations. There also will be pre- and post-camp activities from Manzi and Murekezi in various Rwandan high schools. “What is summer vacation here is like Christmas vacation there, maybe two weeks,” Murekezi says. The 1994 genocide took place over a 100-day period and resulted in the deaths of 800,000 Rwandans as Hutu extremists attempted to wipe out the Tutsi population. Both Rochester students lost several relatives during the period, including aunts, uncles, and in Manzi’s case, his great-grandfather. “This really hits home for us,” Manzi says. The two met at debate competions in Rwanda about nine years ago and reconnected at Rochester. Rochester undergraduates are eligible to participate in the program because of the University’s status as a partner in the Davis United World College Scholars Program, which includes 91 American colleges and universities. 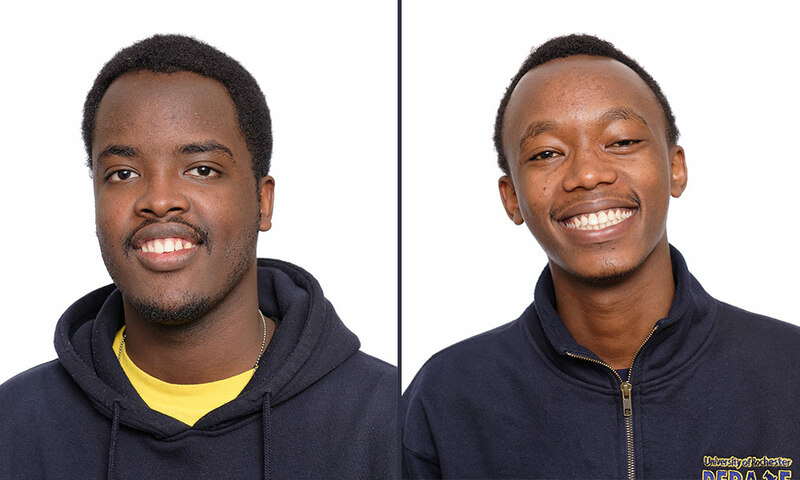 Manzi and Murekezi were advised by the College’s Fellowships Office and nominated by a Rochester fellowships committee of faculty and administrators. Update: Rochester’s 2015 Davis winners have received an additional $10,000 grant from the U.S. Embassy in Senegal to continue their work this summer to explore educational alternatives for children who are forced to work as beggars in the West African nation. The student leader of this project is Rose Mbaye ‘16, a biomedical engineering major from Senegal. Mbaye is working with Mame Coumba Mbodji ’17, a business major also from Dakar; Eyram Adedze ’17, an economics and psychology major from Accra, Ghana; and Boubacar Diallo ’16, a mechanical engineering major from Bignona, Senegal. Diallo is new to the group this year. “Based on the accomplishments and experiences we had last year, we are able to expand on what we did last year, addressing more of the root causes of why there are so many child beggars in Senegal and involving more of the community into taking actions to solve this problem,” Mbaye says. The group will be working with 500 children from 20 boarding schools, with the help of 100 local university volunteers.